Lips can get chapped even in the summer. 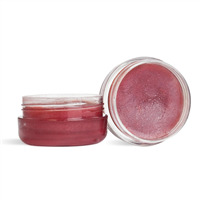 Protect them with this moisturizing lip gloss packed full of nourishing ingredients. To a microwave-safe mixing bowl, add Smooth & Creamy Lotion Bar Additive, Castor and Grape Seed Oils. Heat in microwave on 50% powder until wax has melted. Caution, bowl will be hot. Add in Vitamin E and flavor oil. To color product only, add 1/8 teaspoon red wine mica powder. To show color on the lips, add 1/2 teaspoon. Ths color will settle when adding this much mica powder. To lessen the settling, stir product frequently and let gloss start to slightly thicken. This will help keep powder mixed in. Pour into 12 jars and let product cool completely before applying lids. 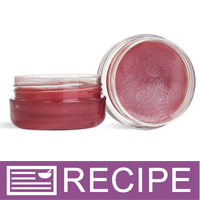 Ingredient Label: Aloe Butter, Castor Oil, Grape Seed Oil, Polyglycerol-3 Beeswax, Fluorphlogopite, Iron Oxide, Flavor, Vitamin E.
"What do the smooth and creamy lotion bar additive do in this recipe? Do I have to use this additive in my lip gloss?" Staff Answer This is needed to give the gloss substance. Otherwise, it would be too soft. You can substitute beeswax for this ingredient if you choose. "what is the consistency of this lip gloss? Is it thick enough to not leak out of the vessel? Is it sticky? Is this best for a lip gloss brush or finger ok?" Staff Answer It is solid enough to not leak out of the jar. If it is sitting in the sun or hot car, it will definitely soften. It is not sticky but a nice texture and fine to apply with either a brush or finger. "can you use anything else besides Castor oil in this recipe?" Staff Answer You can substitute any carrier oil for the castor oil in this recipe. We recommend testing all substitutions in a small batch before making a larger batch for retail. You alone are responsible for product and recipe testing to ensure compatibility and safety. If selling, you would need to change the INCI ingredient listing to reflect any substitutions or changes to our original recipe. "What could I add to make this hard enough for a tube?" Staff Answer This recipe is not suited for lip tubes. Adding beeswax will harden this recipe. We recommend testing all substitutions in a small batch before making a larger batch for retail. You alone are responsible for product and recipe testing to ensure compatibility and safety. If selling, you would need to change the INCI ingredient listing to reflect any substitutions or changes to our original recipe. "Good day, how long will this product keep for. What is the expiration time? Thanks much"
Staff Answer We guarantee a one year shelf life on our kits. This expiration is assuming that products have been stored properly.